This was a rough week for the garden, as we had a huge windstorm on Sunday that left almost everything bruised and battered. This is one more challenge that we tend to have in Southern Nevada that I may have failed to tell you about. The wind whipped through on Sunday night with gusts up to 50 mph that lasted through Monday. By Tuesday, just about everything was bruised, bent or battered. I sadly had to prune some tomato stalks that were full of flowers, but I’m trying not to let it get me down. I think everything will recover nicely; it just looks a little sad right now. So, with that, it’s finally Friday and time for a drink! This drink was inspired by a traditional French 75, which is a cocktail I fell in love with last summer; but I wanted to add a summery, flowery twist to the traditional drink. This week, I discovered St. Germain liqueur, which is a liqueur made with handpicked Elderflower blossoms. The flavor is sweet and floral and for lack of a better description, it just tastes…pretty! Now, this may look like a very girly drink, but it packs a wallop! In fact I’m drinking it right now, and I can’t promise that this post will pass the coherency (is that even a word?) test! So before I completely fall out of my chair, I shall go ahead and tell you how it’s done! Fill the metal portion of a cocktail shaker with ice cubes. Using either a glass or the glass end of a cocktail shaker, muddle the mint leaves and the simple syrup. Add the raspberries to the mix and continue muddling. 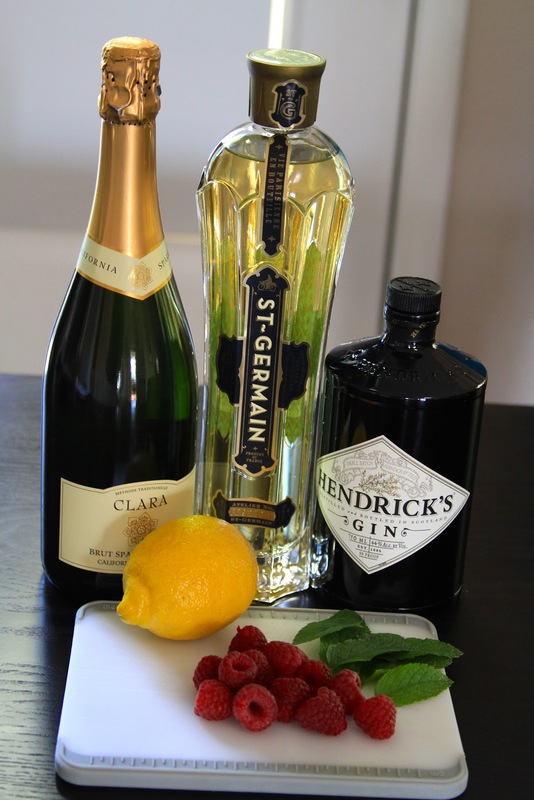 Then add the St. Germain, gin and the lemon juice and stir with a spoon. Pour this mixture over the ice cubes and stir. Strain the mixture into a champagne flute and top with a float of champagne. 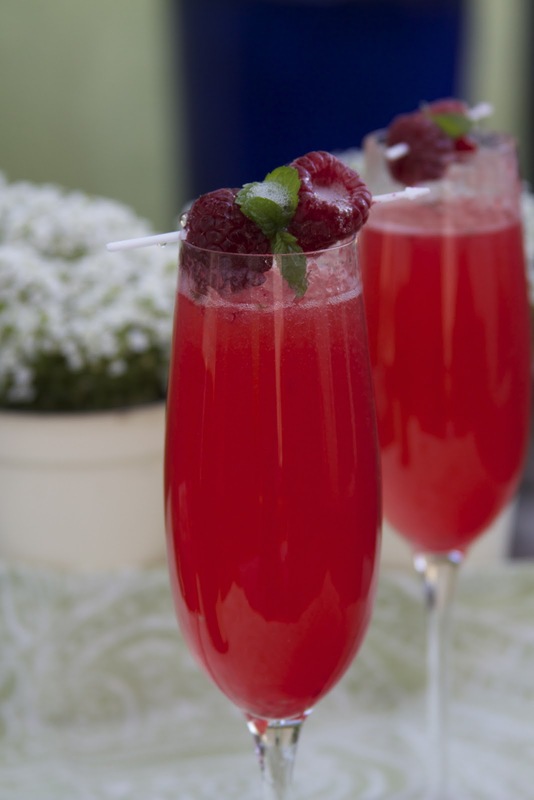 Garnish with mint and raspberries and have a great weekend! Next PostFarro Tabbouleh Salad with a side of Margarita!